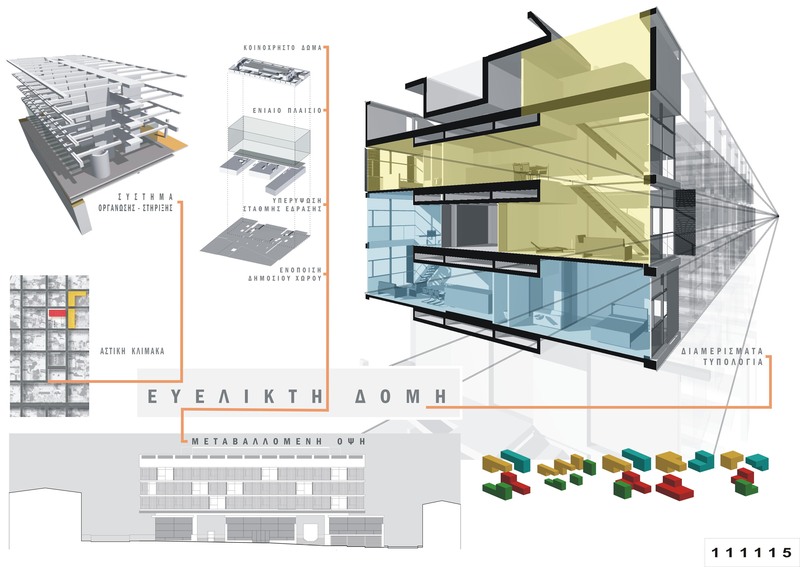 Housing Complex Architectural Competition, GEK. Credits: Nikolaos Ktenas, Yannis Zavoleas, Katerina Vasilakou, K.Mavromataki, VK.Aggelopoulou. 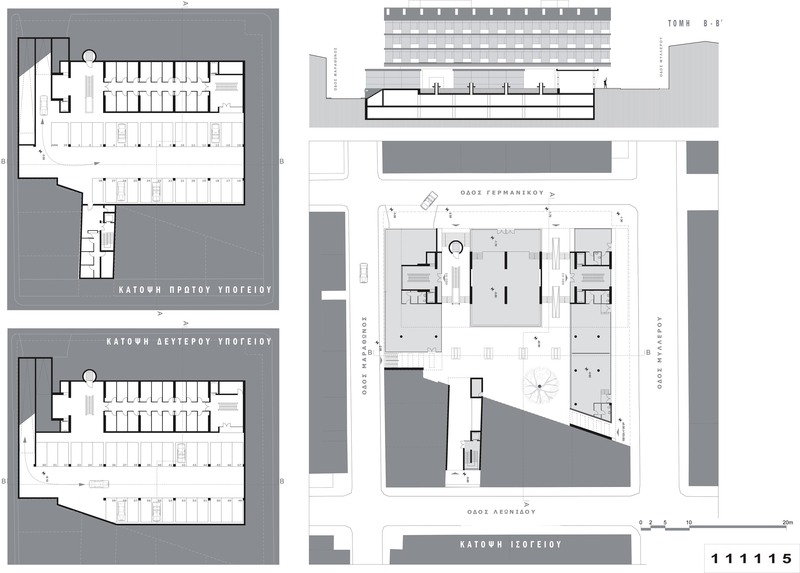 The project proposes an updated definition of the relationship between the citizen and the city. 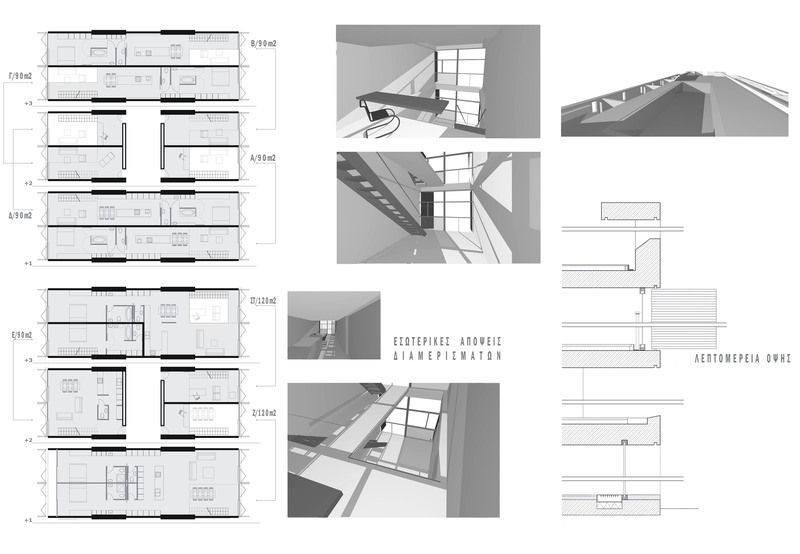 The house unit in incorporated in a large-scale building block, which opens a dialogue with the buildings of equal size. The main building is a clear prism, following the limits of the urban tissue. The street level offers commercial functions, being a continuation of the city. The core of the block is defined as a vital as well as protected yard, yield to the tenants. The building’s main body is placed above the urban layer of the ground. It’s simple grid structure supports the articulation of various apartment types, being flexible and adaptable to the future needs. 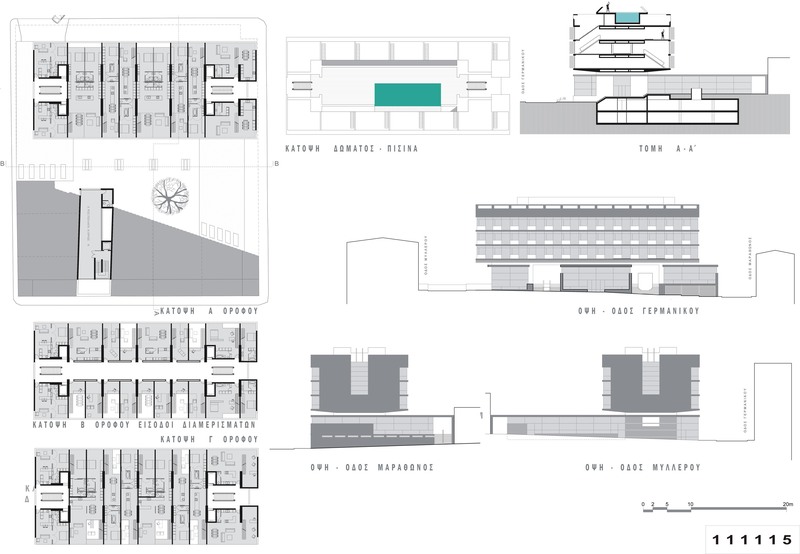 The essence of the project lies in the relationships set by the building as a mechanism that directs the movement from the entrance towards the upper levels. The body and the gaze are constantly oscillating between the public and the private, in so doing reconstructing the inhabitant’s awareness as citizen. The visitor enters from the ground through a protected corridor leading through staircases to the his/her apartment in the upper floors. This pathway is set as an extension of the outer pavement. It offers controlled views to the city and forms the main element of the building’s linear structure. The entry to the main living areas of the apartments reveals again the city view. The city inhabits the interior and is inhabited by it, entering the micro-scale of the apartment and returning through the view from the windows. In the upper level, the terrace with the pool is an open space given to the tenants, as a platform that is separated from the building being suspended above the city.